Opposition parties have criticised Chancellor Philip Hammond after he said “there are no unemployed people” during a BBC interview. Mr Hammond made the comment as he played down the threat posed to people’s jobs by new technology. He later insisted the government had not forgotten the 1.42m people currently unemployed in the UK. But Labour and the Liberal Democrats both seized on his comment, calling him “out of touch”. 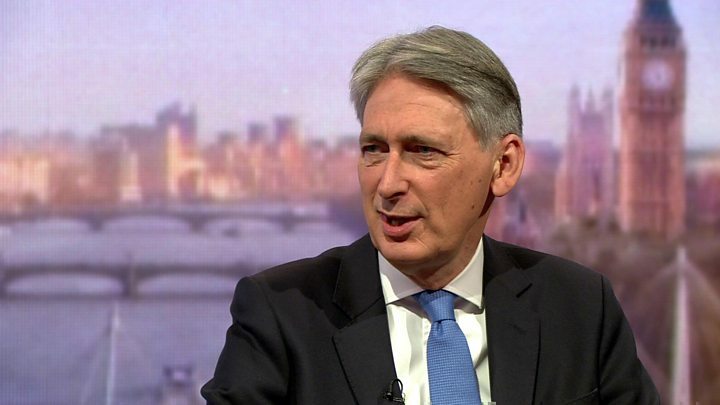 Mr Hammond was interviewed on the Andrew Marr Show ahead of Wednesday’s Budget, where among his announcements he is expected to pave the way for an expansion of driverless cars. Challenged on the impact of wider automation on people’s jobs, he said Britain had to “embrace change”, adding: “I remember 20 years ago we were worrying about what was going to happen to the million shorthand typists in Britain as the personal computer took over. “Well, nobody has a shorthand typist these days, but where are all these unemployed people? According to the latest bulletin from the Office for National Statistics, there were 1.42m unemployed people in the UK from July to September, which was down by 59,000 on the previous quarter. Asked to clarify his remark later in the interview, Mr Hammond said the government was “getting people into work at a remarkable rate”, but ministers had not forgotten those still unemployed. But Labour’s shadow cabinet secretary Jon Trickett said Mr Hammond was “living on another planet”. “The Tories have become even more out of touch and are now so inwards looking that they have no clue of the experiences of ordinary people suffering from seven years of Tory austerity,” he said. Liberal Democrat leader Sir Vince Cable added: “As chancellor, Philip Hammond needs to be on top of the numbers and, as he should know very well, there are actually 1.425m people unemployed.